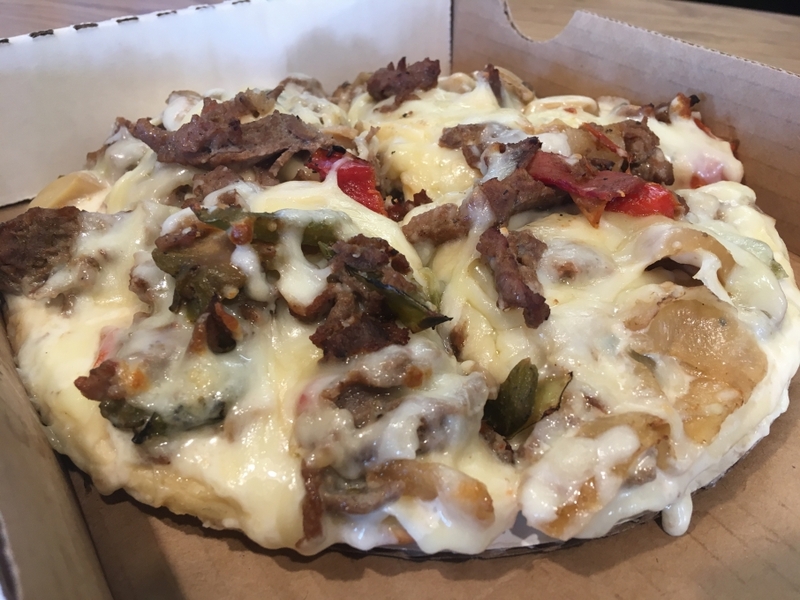 Today is the day you’ve all been waiting for: Greg’s Pizza Shack’s Steak Philly Pizza! We have a personal pizza topped with an alfredo sauce, our super cheese blend, grilled steak tenderloin, mushrooms, and fire-roasted peppers & onions for $7.75! Soups today are Wisconsin Cheddar, Cream of Mushroom, and Friday Favorite Tomato Basil, as well as our typical trio of Chili, Chicken Noodle, Lobster Bisque! 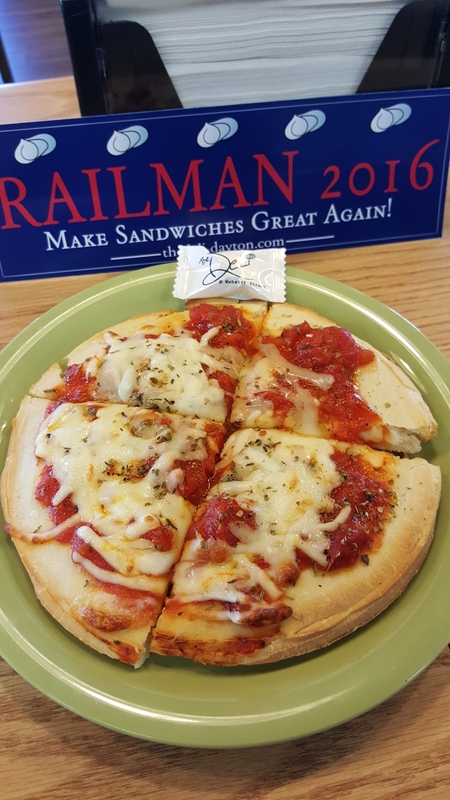 Today’s special comes from Greg’s Pizza Shack! 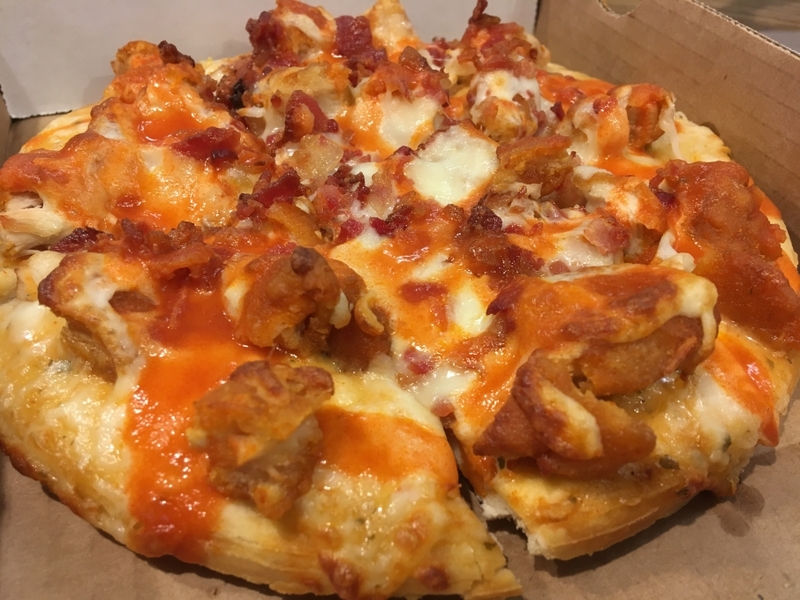 We have a personal pizza topped with buffalo breaded chicken, bacon, and our super cheese blend, served with a side salad (mixed greens, tomato, cucumber, and shredded cheddar) and your choice of dressing for $8.25! Soups today are Spicy Chili, Minestrone, and Friday Favorite Tomato Basil, as well as our traditional trio of Chili, Chicken Noodle, and Lobster Bisque! Today’s special is the Mad Sweet Heat Candied Jalapeno Jam Glazed Bacon Sirloin Sandwich! 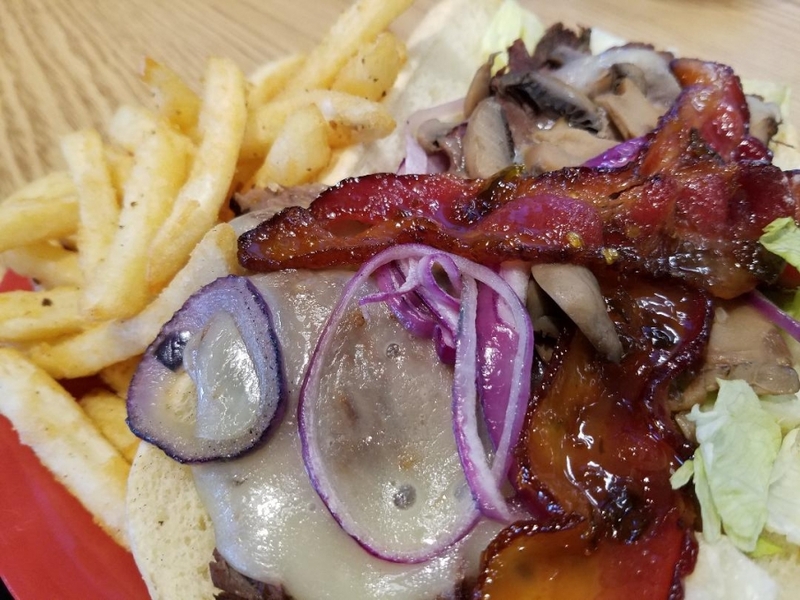 We have a five-ounce portion of our grilled sirloin topped with melted provolone cheese, lettuce, grilled onions & mushrooms, Mad Sweet Heat Candied Jalapeno Jam glazed bacon, served on a toasted sub bun with a side of french fries for the holiday price of $9.00! Greg’s Pizza Shack is back in business for the last Smoked Feature of the year! 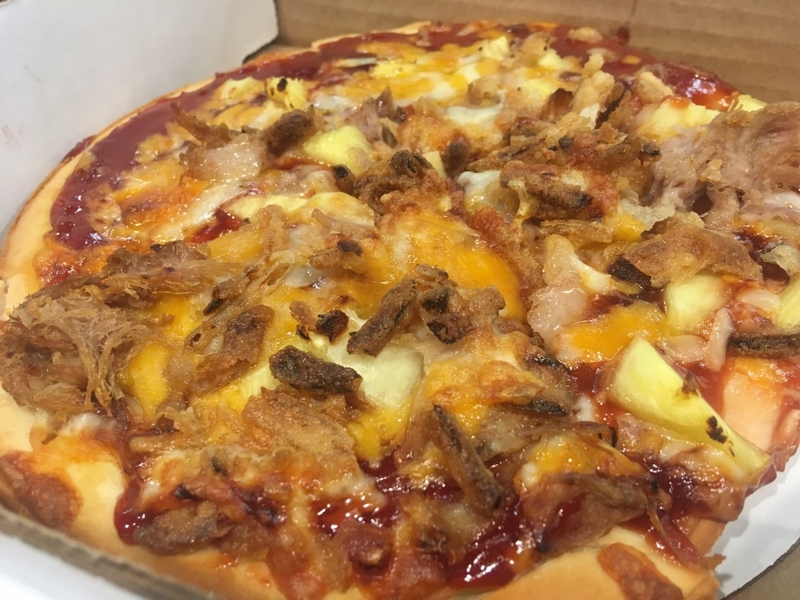 We have a personal pizza topped with smoked pulled pork, pit BBQ sauce, mixed cheese, french fried onions, and pineapple (sorry pineapple-on-pizza haters), served with a mini salad (topped with mixed cheese, cucumber, tomato, and crouton) with your choice of ranch or balsamic dressing, a cookie, and a fountain drink for $10.00! Soups today are Roasted Apple Pumpkin Bacon, Chicken & Wild Rice, Italian Wedding, along with our in-house favorites of Chili, Chicken Noodle, and Lobster Bisque! Soups today are Chicken & Wild Rice, Roasted Apple Pumpkin Bacon, and Italian Wedding, as well as Chili, Chicken Noodle, and Lobster Bisque! 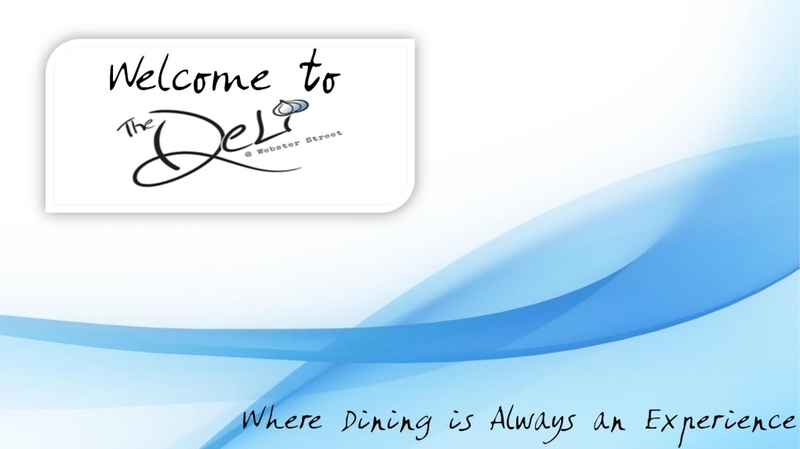 PS – The Deli will be closed from Monday, December 25th, 2017 to Monday, January 1st, 2018 for the holiday season. We will reopen on Tuesday, January 2nd, 2018 at 11:00am! Greg’s Pizza Shack introduces his first appeteaser! Today we are going to enjoy an appeteaser from Greg’s Pizza Shack, fried chicken wings! 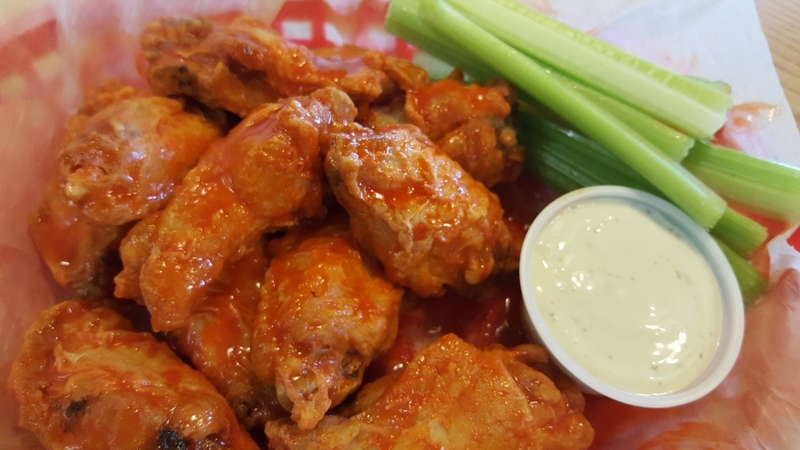 12 wings in your choice of one of Greg’s Grandma’s secret sauces (BBQ, Carolina Gold BBQ, Sweet Thai Chili, or Hot Sauce) with a side of celery and ranch or blue cheese dressing and a cookie and fountain drink all for $7.75! 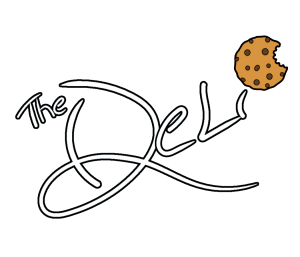 Our soups of the day are Braised Beef Vegetable, Shorty’s White Chicken Poblano Pepper Chili, and Cream of Mushroom, along with our three in-house favorites, Chili, Lobster Bisque, and Chicken Noodle! Greg is busting out some old family recipes today for the Pizza Shack! 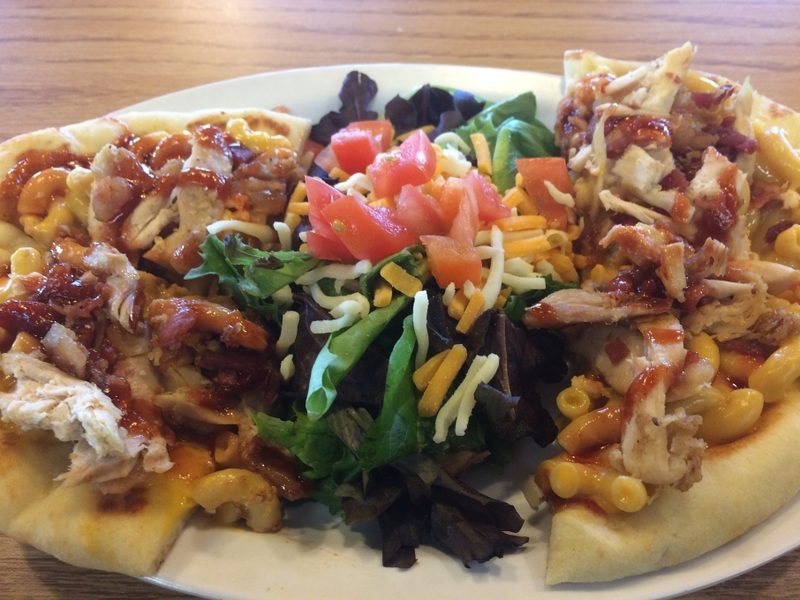 We have mac & cheese, pulled fried chicken, bacon bits, and BBQ sauce on Grandma Greg’s flatbread with a side salad and your choice of dressing for $8.00! Soups today are Shorty’s Flamethrower Chili, Parmesan Kale Italian Sausage, and Tomato Basil as well as Chili, Chicken Noodle, and Lobster Bisque! Greg’s Pizza Shack: Philly Pizzas! Greg is here to chase away your rainy-day blues with some Philly Pizzas! 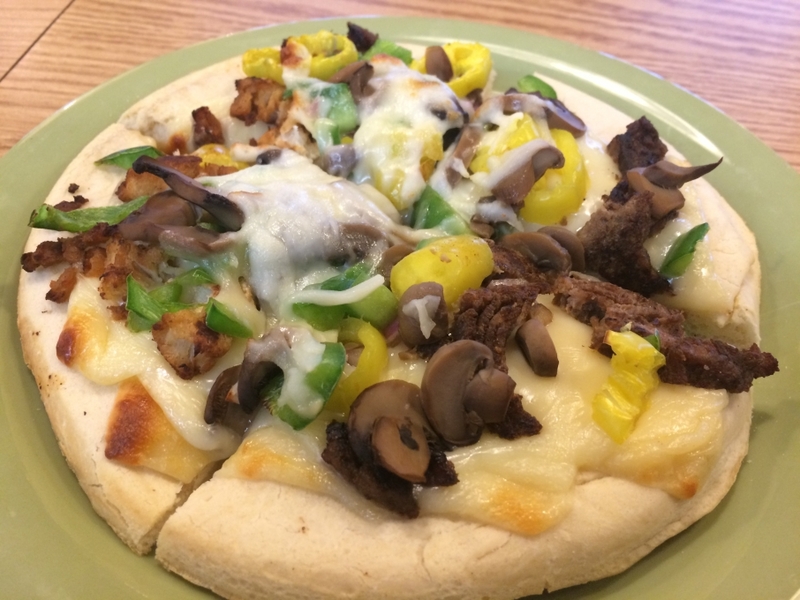 Your choice of either a 7″ personal chicken philly or steak philly pizza with a white queso sauce, our super cheese blend, green peppers, banana peppers, mushrooms, and onions for $7.50! Double the meat for $2.50! 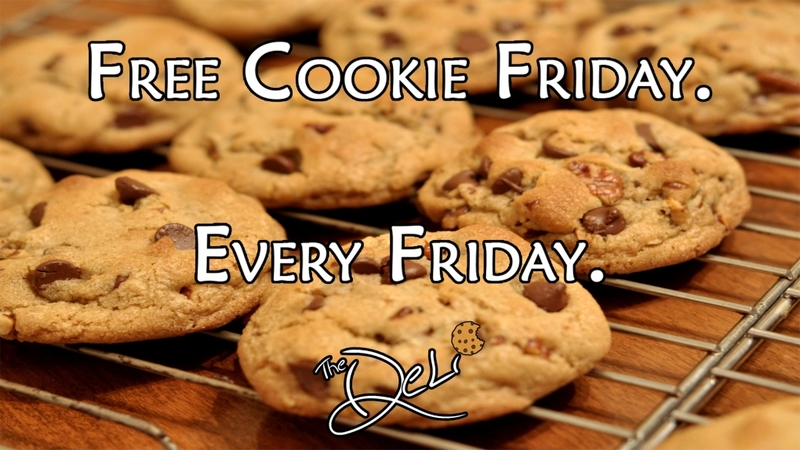 Soups today are Chicken & Wild Rice, Chicken Dumpling, and Broccoli Cheddar, as well as Chili, Chicken Noodle, and Lobster Bisque! Our friend Greg of Greg’s Pizza Shack is not only an amazing Chef de Za, but he is a world-class pizza historian as well. He told us that the people of Easter Island invented pizza right around the same time that they invented Easter, and that is why the Easter Eve pizza lunch is a longstanding Easter tradition! To celebrate today’s Easter Eve pizza lunch tradition, choose between a 7″ ($5.99) or 12″ ($7.99) cheese pizza and add toppings for 55 cents each! Soups today are Tomato Basil, Chicken Poblano, and Cream of Mushroom as well as Chili, Chicken Noodle, and Lobster Bisque! Our local Deli’s Tallest Man, Greg, is a huge fan of pizza – eating pizza, looking at pizza, thinking about pizza, but especially making pizza! 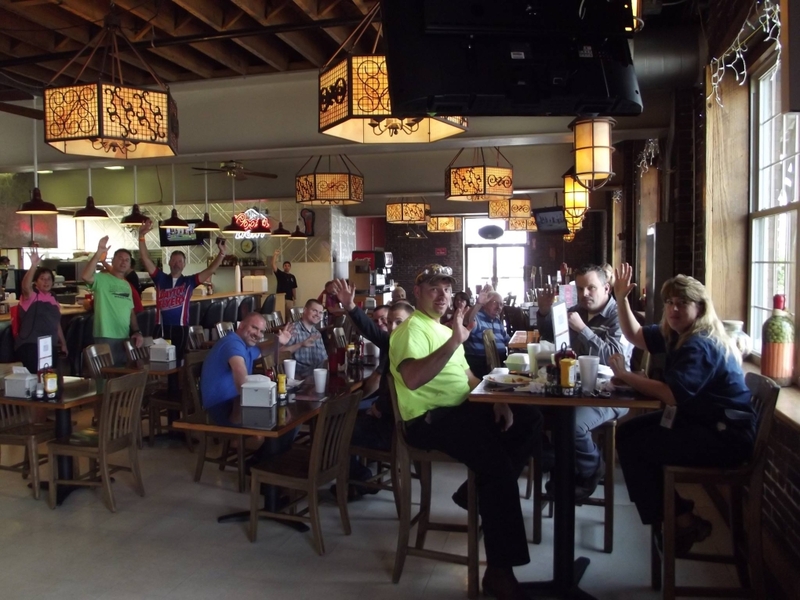 And what better way to celebrate Pi Day than the grand opening of Greg’s Pizza Shack! Today’s ‘za of the day is BBQ Meatball – BBQ sauce topped with our super cheese blend, meatballs, and French’s fried onions! 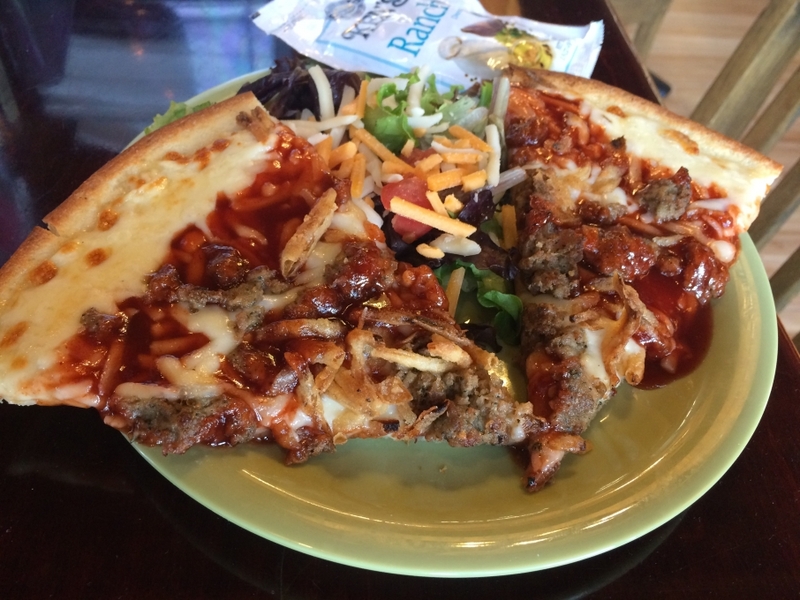 You get two slices of BBQ Meatball Pizza and a side salad for $6.00! Soups today are Broccoli Cheddar, Boston Clam Chowder, and Butternut Squash as well as Chili, Chicken Noodle, and Lobster Bisque!